Everyone needs a good break once in a while. Evan and I just returned from an amazing eight day getaway, filled with some much needed R&R, family, and friends. More about that later in a separate post, but I hope you all can excuse my absence from blogging. Over the years I’ve subscribed to a variety of magazines in search of new and delicious recipes. In July, my subscription to The Food Network Magazine came to an end. Next up? I’ve decided to give Better Homes & Gardens a try! Aside from tracking the recipes down, I’ve only glanced at the remainder of the August issue, but have already decided that I’m going to enjoy this new addition to my reading rotation. This past Sunday we were invited over for a birthday lunch at a friend’s. I was dying to try a recipe from my favorite new magazine, so I eagerly asked if I could bring a dish to share. Success! 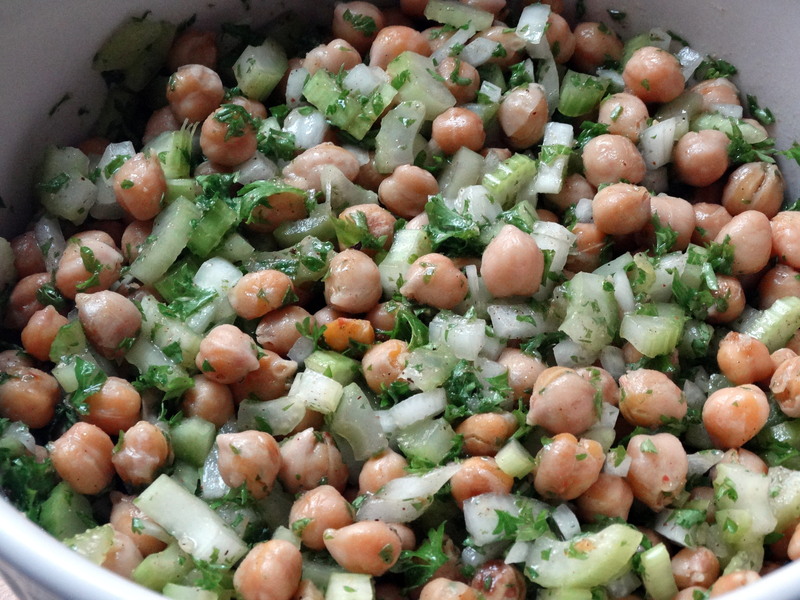 This chickpea salad was a hit at the party. Give it a try at your next get together! 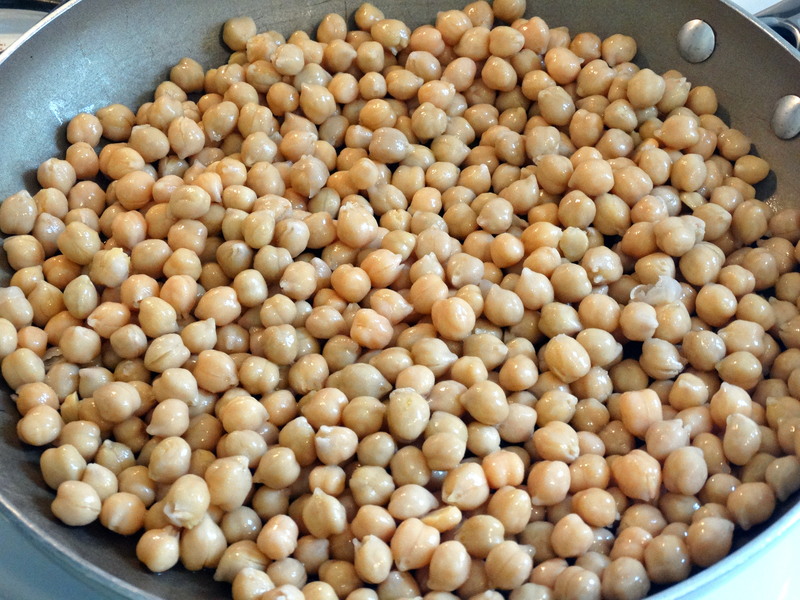 Start by rinsing and draining two 16-ounce cans of chickpeas (also known as garbanzo beans). Heat a non-stick skillet over medium heat with 2 teaspoons of olive oil. Add your chickpeas and sauté for 15-20 minutes or until toasted, stirring occasionally. If the chickpeas are popping out of your pan, turn the heat down a bit until they stay put. 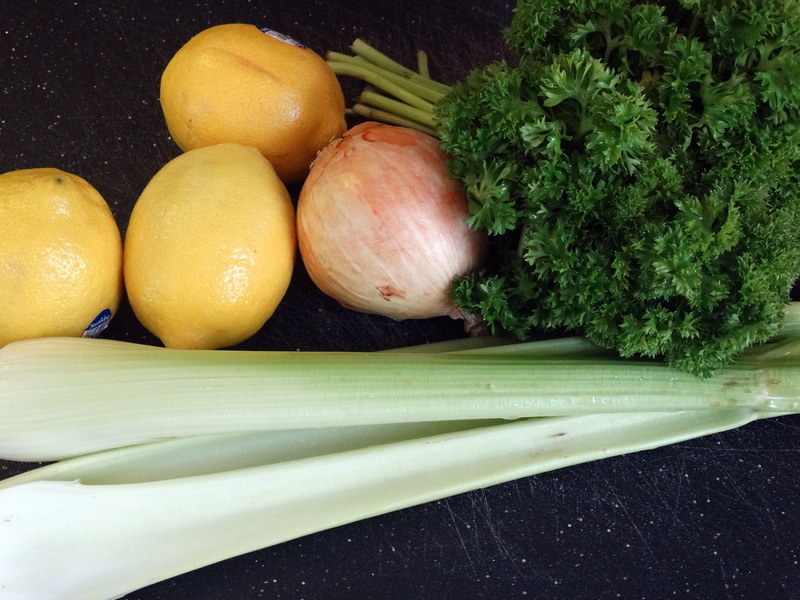 While the chickpeas are toasting, finely chop 2 cups of celery and 1/4 cup of onion. Next, juice 3 lemons and place the juice in a medium container or bowl. 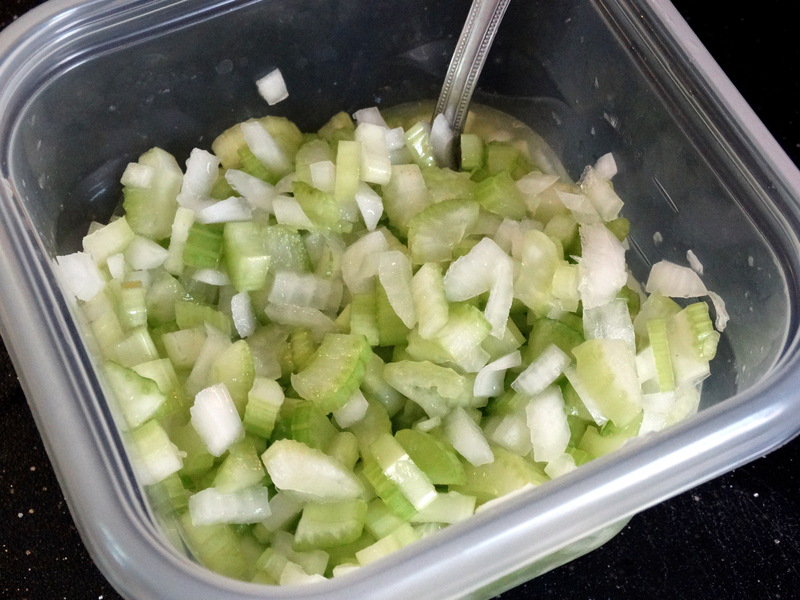 Add the chopped celery and onion, stir to coat, and let marinate for 30 minutes. Chop 1 cup of parsley. I used half of a bunch of curly parsley. Set aside until you are ready to assemble the salad. After your chickpeas are nice and toasted, let them cool to room temperature. When cool, place in a medium sized mixing or serving bowl. Pour in the celery mixture, then add the parsley, 1/4 cups olive oil, and 2 teaspoons ground cumin. Season with salt and pepper to taste. Stir gently to coat. Cover and chill until ready to serve. Viola! Enjoy! 1) Rinse and drain two 16-ounce cans of chickpeas. 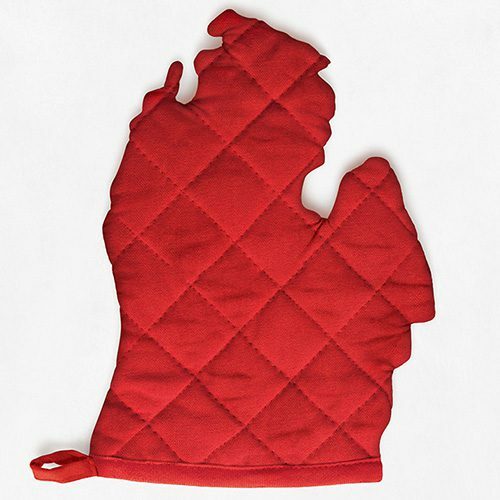 Heat a non-stick skillet over medium heat with 2 teaspoons of olive oil. Add your chickpeas and sauté for 15-20 minutes or until toasted, stirring occasionally. 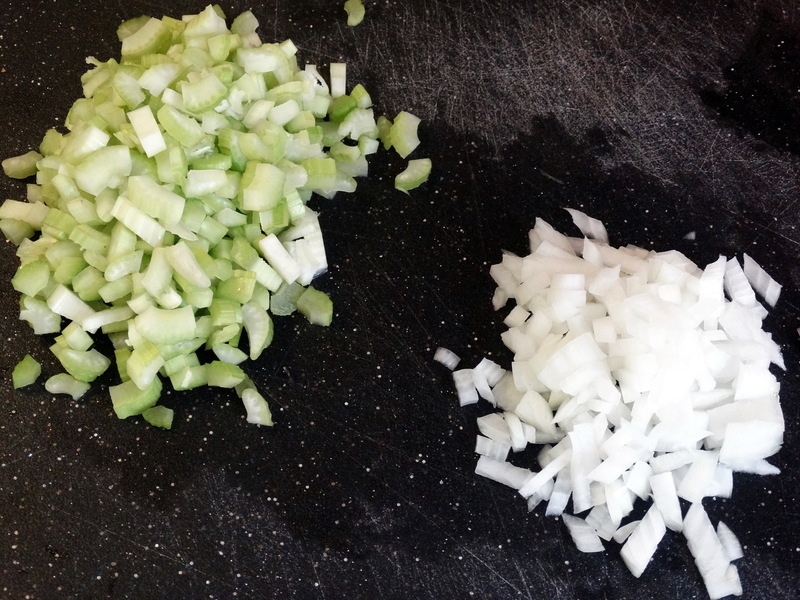 2) Finely chop 2 cups of celery and 1/4 cup of onion. Juice 3 lemons and place the juice in a medium bowl. Add the chopped celery and onion, stir to coat, and let marinate for 30 minutes. 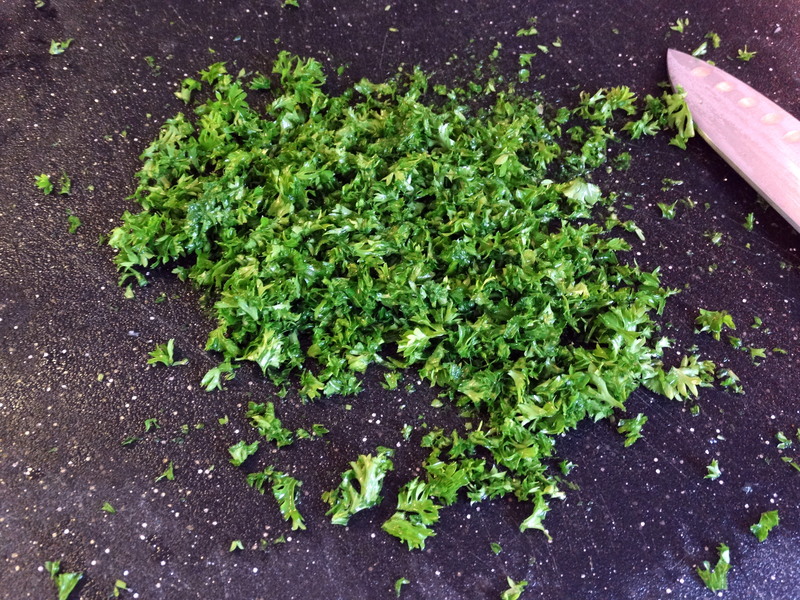 3) Chop 1 cup of parsley. Set aside until you are ready to assemble the salad. 4) After your chickpeas are toasted, let them cool to room temperature. When cool, place in a medium sized mixing or serving bowl. Pour in the celery mixture, then add the parsley, 1/4 cups olive oil, and 2 teaspoons ground cumin. Season with salt and pepper to taste. Stir gently to coat. Cover and chill until ready to serve. Enjoy! This looks delicious, perfect for a bbq side dish!